Nayanthara has been topping the headlines lately for her film Airaa and also due to the sexist comments that actor-politician Radha Ravi made on the actress. The remarks made by Radha Ravi left Kollywood and many other industry members fuming. Nayanthara’s longtime boyfriend Vignesh Shivan came out in support of the actress and urged filmmakers and producers to ban Radha Ravi from future projects. The couple has once again grabbed attention and this time it is not due to any controversy but for an adorable picture that Vignesh has shared on Instagram. This particular picture has sparked rumours of their wedding. Vignesh Shivan Comes Out in Support of Nayanthara, KJR Studios to Ban Sarkar Actor Radha Ravi From Future Projects. On the occasion of Tamil New Year and Vishu which was yesterday (April 15), Nayanthara and Vignesh Shivan celebrated it with the latter’s family. 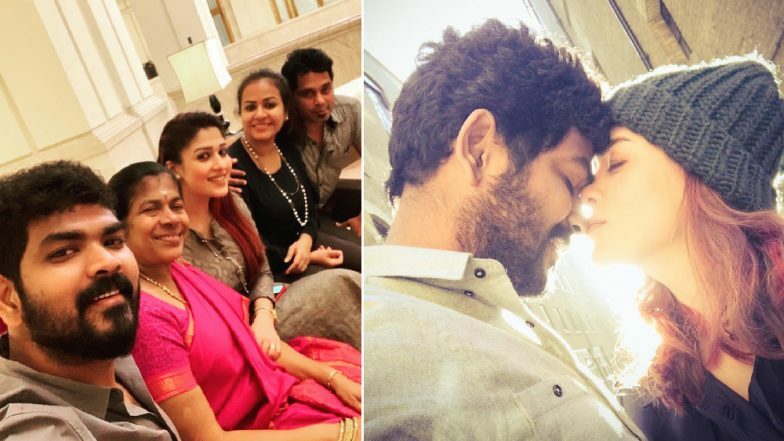 Seeing Nayanthara posing with Vignesh’s family, it has left fans curious whether the couple is planning to tie the knot anytime soon. While sharing the picture he wrote, “Tamil new year & Vishu wishes to everyone :)) Family is everything #mother #sister #in-laws #kaadhal #love #Kudumbam #lifeisallaboutbalance #lifeisallpositive”. Radha Ravi Not Ashamed of Making Sexist Remarks on Nayanthara, Says He Won’t Apologise. Before getting into a relationship with Vignesh Shivan, the Lady Superstar Nayanthara was dating PrabhuDheva. The duo called off their relationship in 2012 and it was confirmed by the actress. It has been almost four years since Vignesh and Nayanthara have started dating. The lovebirds met on the sets of Naanum Rowdy Dhaan. It was during an award function which happened last year when Nayanathara called Vignesh as her fiancé. So do you think wedding is around the corner for this lovely pair?